Creating Life in Colour: Calvin's been Scrapped!! Hi all, it's been a while since i updated my blog as i've been FLAT OUT!!! Looking after a newborn is hard work - especially when i'm breastfeeding!!! And in my 'spare time' i've wanted to scrap, rather than blog!! Anyway, i've actually managed to do a couple of pages of Calvin, so i thought i'd share them!! My first page of Calvin was using his first ever photos!!! I've created it using some of the awesome new papers from Fancy Pants in the "Little Sprout" range, along with some matching rubons, thickers and a Martha Stewart Punch. 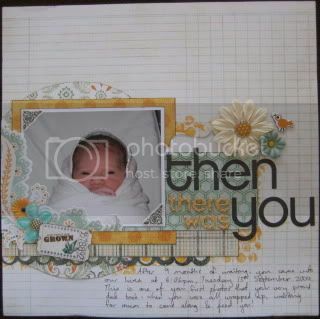 The base paper had "The Day You Were Born:" on it, and so i've written the story of Cal's birth on it!! This page was based on a pagemaps sketch from the Scrapbook Capital October sketch competition. The next page is a beautiful photo of Aunty Sarah with Calvin - she just loves him so much!! I've used a mix of October Afternoon "Ducks in a Row" and "Cherry Hill" - my new favourite combination!!! This page was for Scrapboutique's October stash stomper challenge. Using this same patterned paper combo, i've created the next page - a page about how Calvin makes me so happy. It's amazing how i feel when i look at him and hold him - the most incredible feeling in the world!! 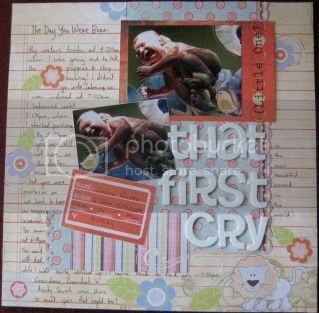 This page was based on a Scrapbooking From Scratch blind challenge! My final layout was created based on the recent "For Him" LO by Zoe Pearn at Scrapboutique. Zoe is a designer for MME, and it's using MME papers from the new "Ooh La La" range - isn't it beautiful!?!?! I'm also working on a mini album from the same set of classes - the class was last night, and i got about half of it done, so hopefully i'll get the rest done next week. No more scrapping for me this weekend as i'm going to be flat out!! Calvin is being baptised tomorrow, so we've got the family down all weekend. Not sure that i'll get much done next week either - Jeremy will be working all week, so i'm going to be on my own for most of it! Plus, i really need to think about Christmas Cards!!! I can't believe how quickly Christmas is sneaking up on us this year! !